The content of this article provides interesting history, facts and information about the Emperor Septimius Severus and the all-powerful Caesars who ruled the empire of Ancient Rome. "The Emperor who increased the number of the Praetorian Guards to fifty thousand men"
Short Biography profile and facts about one of the most famous Romans of all, in the life of Septimius Severus, Emperor of Rome and provinces of the Roman Empire. Obtain a fast overview of the times of the Roman Emperor Septimius Severus from the following facts and information about his life. Why was Septimius Severus famous? The Praetorian guard had murdered the Emperor Pertinax. Didius Julianus, a wealthy Senator paid to become the next Emperors. The armies in the provinces rose in revolt when they received news of the auction and refused to acknowledge the authority of Didius Julianus. Three men wanted the throne: Claudius Albinus who commanded the legions in Britain, Pescennius Niger the army of the East and Septimius Severus who commanded the legions in Pannonia. Pannonia was an ancient province of the Roman Empire bounded north and east by the Danube and covered parts of Hungary, Austria, Croatia, Serbia, Slovenia and Bosnia and Herzegovina. Didius Julianus was ousted and sentenced to death. Septimius Severus battled against Pescennius Niger who was defeated near Nicaea and decapitated. Septimius Severus then fought against Claudius Albinus winning the battle at Lugdunum (Lyon, France). Claudius Albinus was put to death. Other deaths followed, showing the cruel nature of Septimius Severus. Forty-one Senators, who he accused of having favored Claudius Albinus, were also executed together with their wives and children. Many of the Iberian provincial nobles of Spain and Gaul also shared the same fate. Accomplishments, achievements and important events. Despite his cruel nature Septimius Severus was in many respects a useful ruler; strict in the administration of the laws, careful to correct abuses and practised impartiality. Peace returned to the provinces, cities were re-populated and roads were repaired. Rome abounded in provisions, and the people were satisfied. 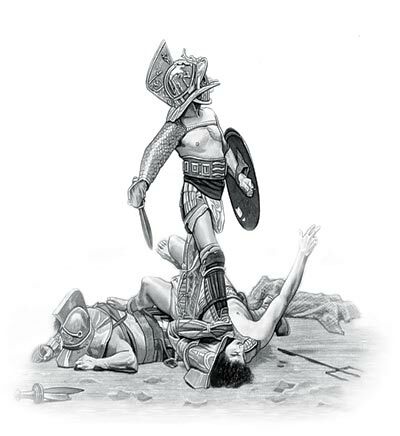 Septimius Severus changed the constitution of the Praetorian Guards, and filled up their ranks with the bravest soldiers of the legions of the frontier. Septimius Severus believed that they would be able to suppress any rebellion that might arise; and he increased the number of the Praetorian Guards to fifty thousand men. The Prefect of the Praetorians, who had at first been a simple soldier, now became the chief minister of the emperor, and was at the head of the finances and even of the law. Septimius Severus despised the feeble Senate and assumed both the legislative and the executive power. Romans began to treat the emperor as the source of all law leading all future Romans to an abject dependence upon their rulers. The wife of Severus, Julia Domna, a Syrian lady of great beauty and various accomplishments, became the mother of two sons, Caracalla and Geta. Septimius Severus hoped that they would prove worthy of the high office to which they were born. However, the sons of Septimius Severus showed themselves incapable of any serious study or employment, and were chiefly remarkable for the hatred they bore toward each other. The royal court of Septimius Severus divided into two factions, composed of the adherents of either son. Septimius Severus tried his best to remove their rivalry as he foresaw that one must fall a victim to the hatred of the other. In A.D. 208 a war broke out in Britain, and Septimius Severus, although now more than sixty years of age, and afflicted with the gout, so that he was carried on a litter, set out at the head of his army, attended by his two sons, and penetrated into the interior of Scotland. This was his last enterprise, for he died at York on February 4, A.D. 211. He left his empire to his two sons, Caracalla and Geta, who returned to Rome, and were acknowledged by the Senate and the army. Septimius Severus and the Year of the Five Emperors (192 - 193). Following the murder of Commodus Rome saw a year of turmoil and chaos in Rome. Pertinax becomes emperor but is murdered by angry soldiers. The empire is then sold to Didius Julianus who is soon ousted and Pescennius Niger is proclaimed emperor in Syria. Septimius Severus then marches on Rome and disarms the Praetorian Guard which resulted in Claudius Albinus being recognized as Caesar. He loses the power struggle with Septimius Severus who is proclaimed Emperor and begins the Severan Dynasty. The content of this Septimius Severus category in the Emperors of Ancient Rome provides free educational details, facts and information for reference and research for schools, colleges and homework. Refer to the Colosseum Sitemap for a comprehensive search on interesting different categories containing the history, facts and information about the lives and people of Ancient Rome.